The folks at Catskill are seriously environmentally friendly. When they make their astoundingly tough cutting boards and kitchen islands, they ensure the wood they use is harvested from a non-endangered, self-sustaining source, and they also make sure no waste products are left over from the manufacturing process. Absolutely everything is recycled (even the sawdust) to create wooden fuel beads that the locals use to heat their homes in winter. After all, if you worked within the natural beauty of the Catskill Mountains, you’d want to keep the land looking beautiful, wouldn’t you? Here’s another thing of beauty: the Microwave Cart. 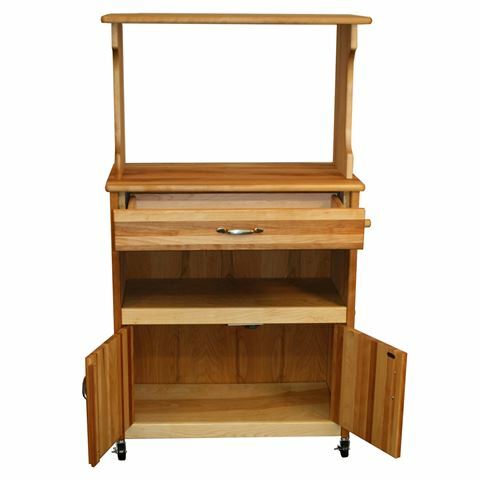 But, of course, it’s not just for microwaves: this solid wooden unit is ideal for small kitchen appliances, dinnerware, utensils and more, thanks to its butcher block top and hutch, adjustable internal shelf, cabinet storage and more. Plus, the locking casters allow you to move your Cart to wherever you please in the home. Made from sustainably sourced hardwood. Warp-resistant hardwood veneer side panels, back panel and interior shelves. Solid wood doors, drawer, table top, shelf, braces and legs. Butcher block top and hutch. Drawer, open shelf and cabinet storage. This product is not available online. It may be purchased from our Kensington store or Alexandria Weekend Warehouse – or, if you live in the metropolitan Sydney area, call us on (02) 9662 1099 for a postage quote. Overall Assembled Dimensions: 79cm (l) x 135cm (h) x 43cm (w), approximately.